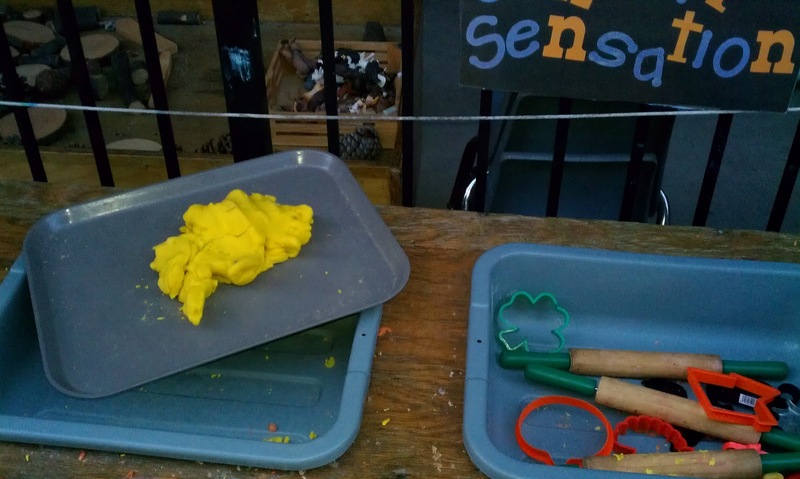 I really enjoyed Jenny's blog (Let the Children Play) this week about creative ways to store loose parts in the Outdoor Classroom. I wanted to piggy back on her post because I LOVE to learn about creative ways to organize the environment. There were so many great ideas on her post. She was kind enough to feature my idea about using milk crates for outdoor storage (to get directly to the post, click here). 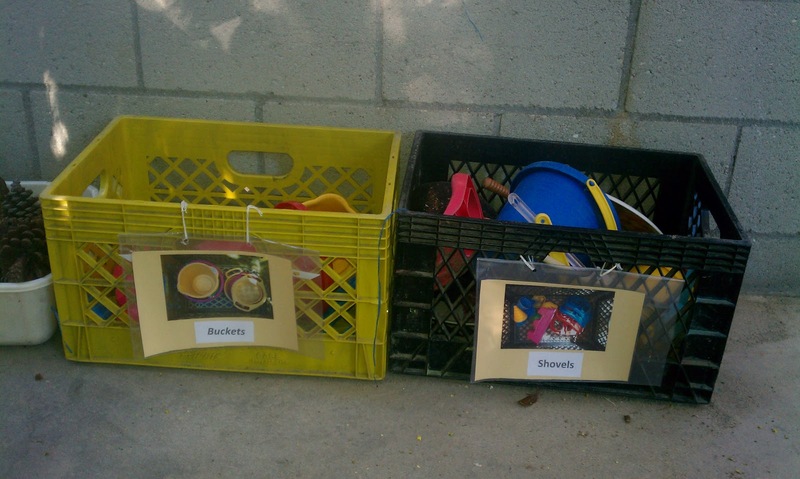 Milk crates are a wonderful "loose part" in themselves, but they are also a terrific way to store shovels, buckets, natural items, pvc pipes, mud kitchen materials, and more. They can be hosed down, the sand falls through, and they can be easily labeled. We have several classrooms ages 2 - 5 who use the same playground, so labeling is essential for us. 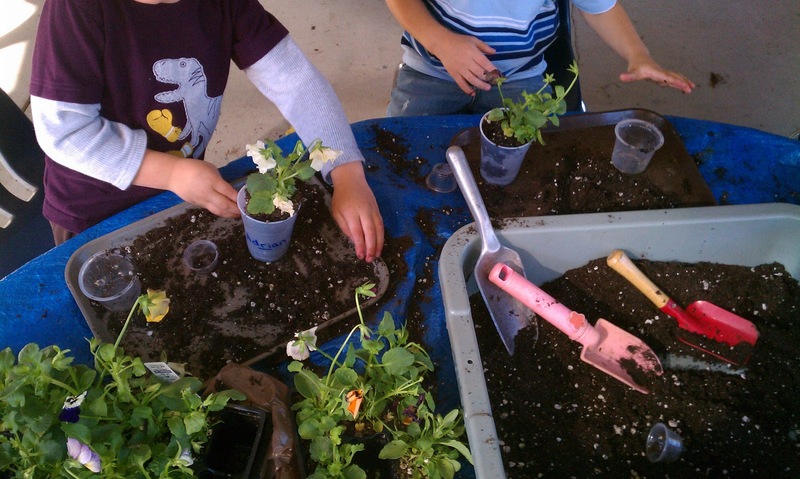 Each class in our school is asked to "reset" the Outdoor Classroom (ie - clean it up!) before the next class comes out to enjoy the yard. 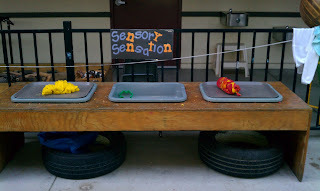 Another great storage trick we have is our 3 bin sensory/water tables. These tables were custom made and hold 3 removable utility bins. They are very simple and wouldn't take much to recreate. 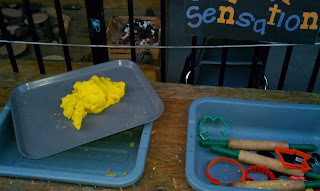 When we are using playdough, we put cafeteria trays over the bins to create a flat and elevated surface on which to roll and mould the dough. We store the tools in the middle bin. 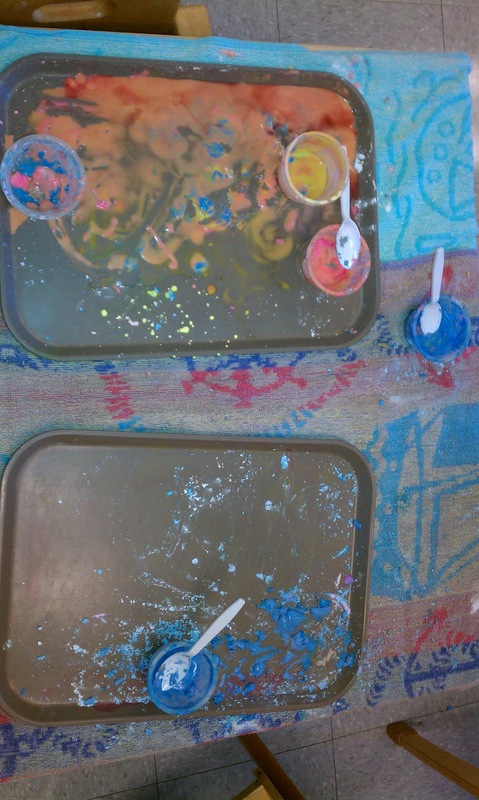 When it is time to clean up, we pop the playdough in a bag, and everything goes under the trays. Take note and look UNDER this table...the tires and tarp are for overnight storage. We lay the tarp on the table and hold it down with tires. The tires are also used as "loose parts" in our Outdoor Classroom. 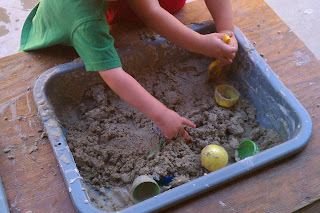 When we are playing with water, goop, ooblek, etc., we take off the trays and put it straight in the bins. This table is EXTREMELY versatile! 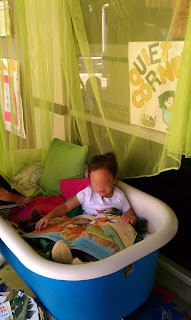 Our outdoor "Quiet Corner" is an old bathtub! We've stacked blankets inside so the children don't have to sit too low into the tub and lined the top with pillows to make it extra soft. The books are stored in a simple woven basket. This is a covered area, so we do not do anything to protect it overnight or on weekends. Use baggies to keep make clean-up a breeze! I have worked in education for years and have always dreaded cleaning up the paint jars. When I started my role at this preschool, I was so impressed to see their idea for creative cleanup...line the jars with ziplock bags! Not overly environmental, but we do keep the same liners for a week since they don't tend to dry out. We store the jars in a caddy in the shed overnight. We wash the brushes and tops as needed. Our 2's teacher used cafeteria trays and lined the tables with towels for their cornstarch and water sensory experience (click here for the ooblek recipe and the science behind it; and if you haven't tried it, you MUST!!!!). It was a neat change from the traditional method of using a bin. 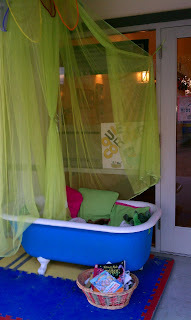 She provided colored water in recycled applesauce containers, spoons, and cups of cornstarch for the children to explore. 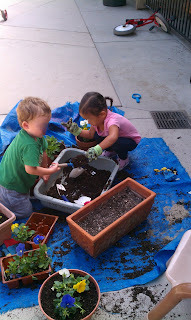 When our 3's teacher was planting flowers in pots, she lined the ground with a tarp and put the dirt in utility bins (we have as many of these bins as we do milk crates!!!). She provided child sized gardening tools and she let the children do the potting. When the project was complete, we rolled up the tarp and dumped the contents over our raised garden beds. Since we received WAY too many Pansies this season, I had each child plant a Pansy in a cup to take home. I used the same tarp and bin method, but we sat at a table since we were on the patio. This is one of our "diorama" tables. 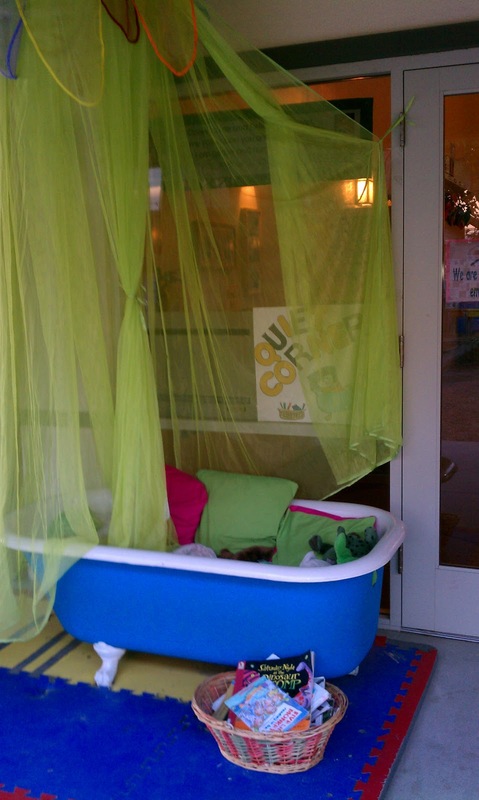 They were also custom made by the same person who made our other sensory boxes. Again, these tables would be VERY simple to build. 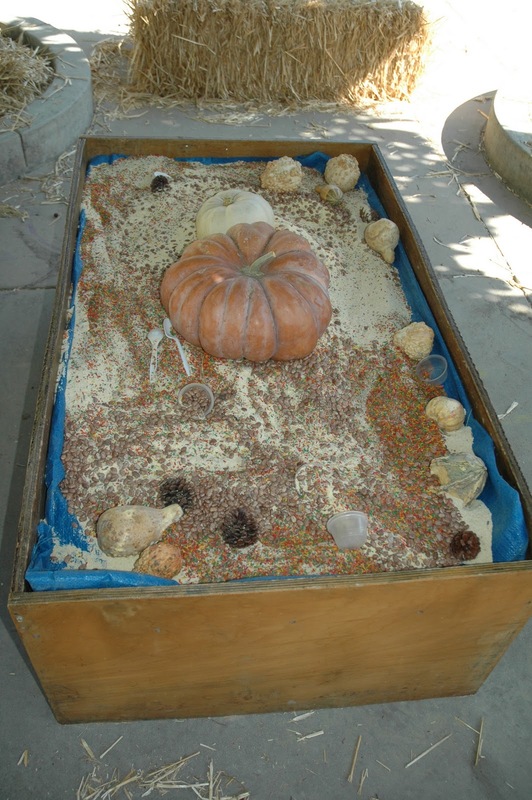 To make this sensory box, we lined the table with a tarp (for easier cleanup), and then poured in cornmeal, rice and beans. This is the same table in use during our "dino dig." To the left, you can see our other diorama table which we used for the "science lab" area. We also use these tables for Duplo, Lego, tree blocks, doll houses...you name it! Tarps and tires cover pretty much everything that needs to be protected at night. In the morning, set up is quick and easy as I just have to fold the tarps and toss the tires to the side. Remember, tires are a fantastic loose part, so they are part of the children's play environment. I hope you found these tips useful. Please feel free to add your own clever ideas! You are BRILLIANT. Love all of your storage ideas, but expecially the paint baggy idea! I too dread clean up after painting. It's so messy, and there's so much paint just washed down the drain! I'm so excited to try your idea! Hope you don't mind but I'm sharing on my f/b page! Thanks for the comment! I wish it was I who was brilliant, but really these practices were all in place when I arrived at the school. We have a very experienced staff, so I have learned so many tricks of the trade from them! And of course...share away...that is the joy of blogging, posting, FBing, and Pinterest! Gotta love it! They all children's are very happy and i want to excited for play with them. Great pictures which you share above. I impressed by the beautiful place. Thank you for sharing such brilliant idea. It was indeed very useful and practical. Great job!